As Autumn sets in and the days grow colder, we here at Clare Florist would like to help you to feel Sunny for a little while longer. We feel that nothing captures the warmth and delight of the sun like a bouquet of Sunflowers, which is why we have created our bouquet bursting full of warm tones that are sure to brighten up your home during the colder months. There aren't many ways to give someone you love a gift of sunshine, but this is one! The Sunflower Surprise is a warm, vibrant bouquet packed full of fabulous Sunflowers that capture the essence of hot summer days. The broad, yellow faces of sunflowers are always a welcoming sight; and with a bold arrangement of bright and sunny sunflowers set against the freshest lush green foliage, this bouquet will put a golden glow into any room. Don't forget – you can get your flowers delivered to ANY UK address, with free standard next-day delivery included. 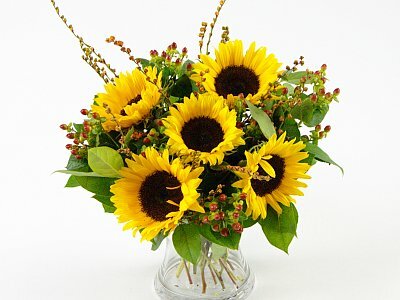 So send this gorgeous golden Sunflower bouquet to someone that you've been thinking of, and make their day wonderful!